I am delighted to see that this years FOSS.in will indeed take place. There were rumours about it not happening but fortunately you will have the opportunity to have a great time from 2010-12-15 to 2010-12-17! As last year, I expect the conference to be great. 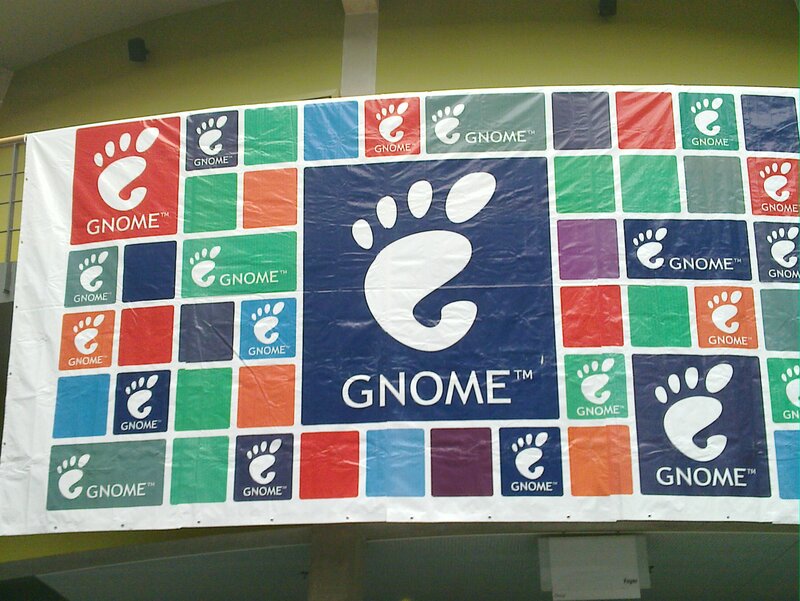 I do hope, that GNOME will be well represented, especially since GNOME-3 will be released and we have the potential to attract many new hackers. 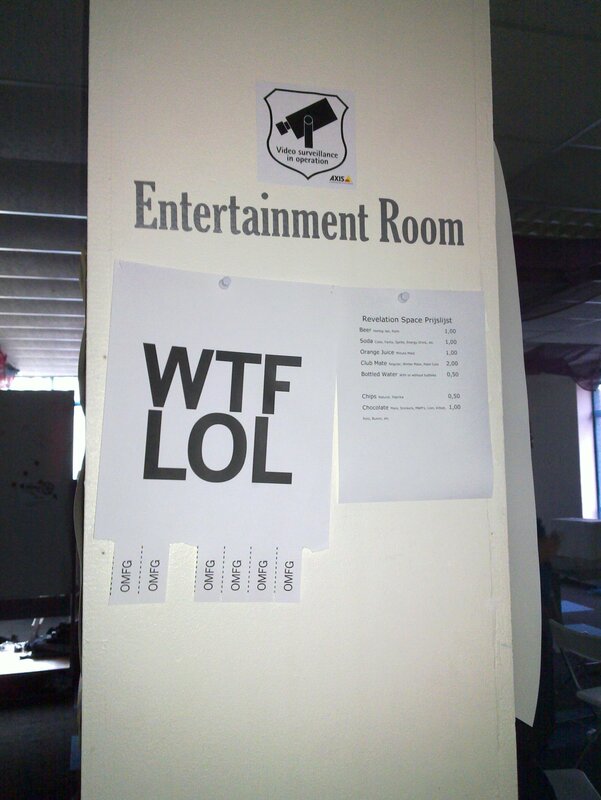 Also, because the KDE folks were staffed very well and we were not. Unfortunately, it took them a while to ship that thing so that I received it half a year later or so. But then it was amazingly fast. I received a parcel from Helsinki (2031km far away) which was sent 20hrs earlier. The parcel thus was traveling at ~100km/h. Great service, DHL! Thanks a million Nokia, Thanks Maemo Bangalore! I really like the N900 because it’s a Linux based device. Well, there is Android, right? But Nokia actually does send it’s patches upstream and they invite you to get root on the device you own. Plus everything is pretty much standard. There is D-Bus, there GTK+, there is Python, there is Linux, … Hence, building and running stuff is pretty easy. I am looking forward to run my DNS Tunnel and DOOM and play around with the USB. I am now busy playing with my new N900. As mentioned in the last report, I skipped one week in favour of the GUADEC. if (status == -1) error_report("%s: read packet (%lu) data on stream %p "
if (status == -1) error_report("%s: writing packet (%lu) data on stream %p "
if (status == -1) error_report("%s: %s (%p) packet (%lu) data on stream %p "
but it wouldn’t compile because fread and fwrite have slightly different signatures. Thanks to Roland for pointing that out. On smth unrelated: Fought with OpenSSL and it’s API and documentation. But more on that in a different post. Annoyed by the fact, that it takes ages to “make” a freshly made kernel! Trying to automatically create a FAT image and fill populate it with the built modules is more cumbersome than expected. guestmount is way too much overhead: It requires qemu and channels the data out over the network (sic!). I just want a FUSE implementation that is capable of writing a FAT image! There seems to be UMFUSE but it’s packaged for Debian/Ubuntu and not for Fedora.Find the sources is quite a challenge (it’s here: https://view-os.svn.sourceforge.net/svnroot/view-os/trunk/fuse-modules/fat) but I can’t build it, because they haven’t really prepared their code for anybody else to build it. After being harassed to generate the ./configure file (autoconf,; aclocal; autoconf), it also wants shtool to be installed AND in a local directory (/.-). I gave up as it kept bugging me about a missing config.sub. But I still wanted to get that FUSE module so I dug up my Ubuntu chroot and apt-get sourced the files, ./configure && make && make install. Beautiful. Turns out, that the official FUSE wiki lists two ways to mount a FATfs: the one I’ve just described and a dead project (FatFuse). So yeah, all in all, I didn’t make any substantial progress I hope to finish a Webcam in software soonish though. But the week started with some work. 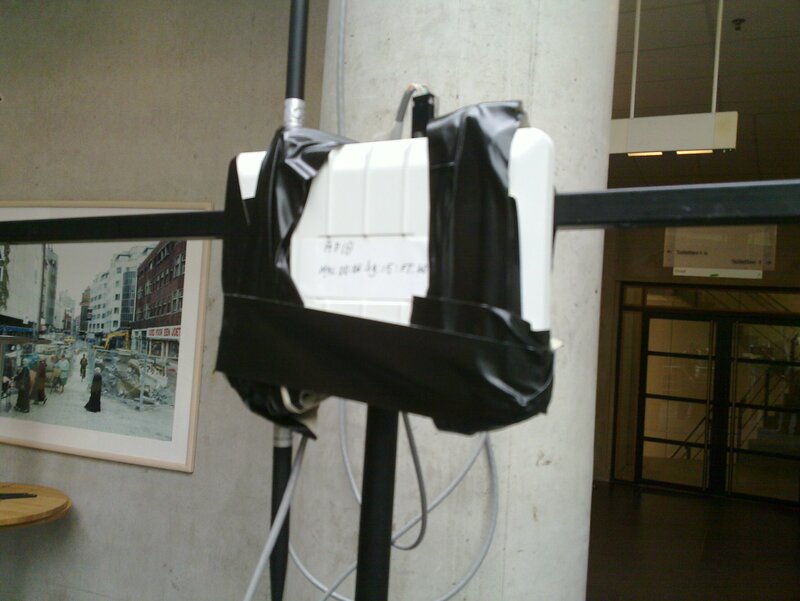 Apparently, the network was not fully set up yet and we had to use a lot of duct tape to set everything up. After people saw me being “in charge” for the network, they started to complain why the network was not running properly The problem was, that the Uplink was kind of broken. Basically a big firewall blocked that many connections because it thought it was under attack. 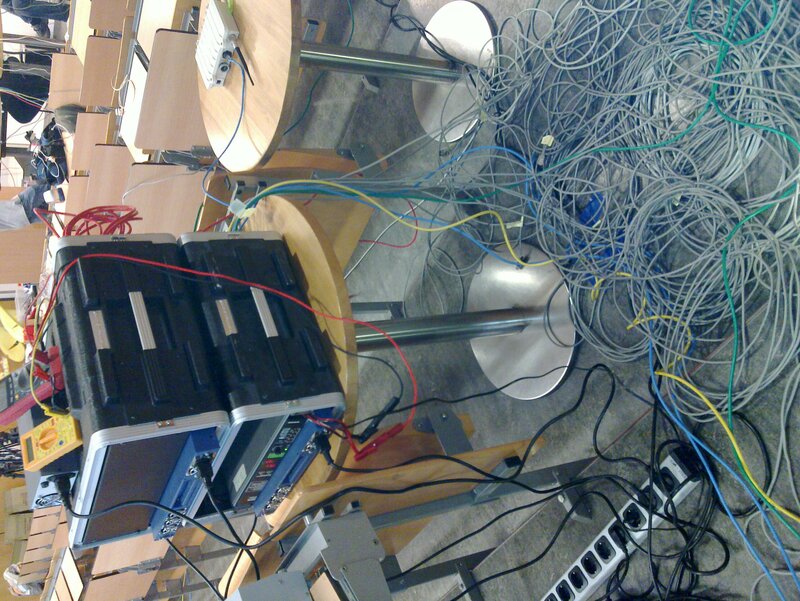 The solution then was to claim some of the universities IP addresses and do a big SNAT for the users. Having said that, the network was up and running perfectly on Wednesday, making it a perfectly networked GUADEC The last GUADECs usually had some troubles with the connection even after the event started (remember the broken uplink on Gran Canaria or the rather bad wireless situation in Birmingham?). The talks were streamed and I hope recordings will be made available soon. Good summaries were already given in the official GUADEC blog and various others so I won’t go into too much detail, because . I haven’t seen covered that Xan and Fernando mocked about the newly promulgated Speaker Guidelines which they didn’t respect either. It’s an interesting discussion though. It is obviously a shield for attacks from the outside so that we (as GNOME) can point to these guidelines if one of our speakers might have offended anyone. But do we, as GNOME, need such a thing in first place? And what happens if we refer to those guidelines over and over again but nobody complies with those? Probably nothing. But do we need to lie to ourselves then? Can’t we expect the people to have enough common sense? Do we want to be a community where we can’t assume enough common sense? An issue that I didn’t really understand was that the usual picking on Canonical took place. Apparently, people expected Canoncial to contribute more since 1999 than they actually did. But they have been founded 2004… That comment summarizes that fact well. Also, I don’t really get why people expect a distributor to engineer stuff in, say, GNOME. I don’t hear anybody complaining about, say, Mandriva or Gentoo. Bred Kuhn told us to save human lives by rolling out more crypto within GNOME. I couldn’t agree more. But sadly, we have a long way to go. For now, you can’t even handle your OpenPGP key in a sane way, i.e. rolling over to a new key. It strikes me that we still don’t have a concept encrypted end to end communication, i.e. with Telepathy (well, email is too broken to be tackled). Apparently XTLS should be used. But no PKI will be used, thus discouraging the enhancement of the OpenPGP Web of Trust. It would be absolutely brilliant if Telepathy used OpenPGP keys (maybe even create one if none existed). If then spoken with another entity via Telepathy, it could ask the user to verify the other persons identity via, say, a Videochat. That chat would use the public key material for encryption. The assumption is that the two parties know each other and that a man-in-the-middle cannot spoof valid data quick enough. The other persons key would then more or less automatically be signed. I talked a lot to Stef Walter and other people around GNOME-Keyring and Seahorse and we had good ideas. Let’s see how much we can get done. I also had a few discussion related to the GNOME Foundation Membership process. 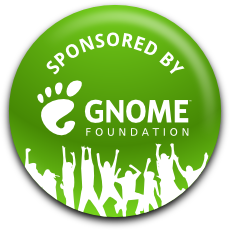 We somehow have to think about the people that feel intimidated joining the GNOME Foundation. 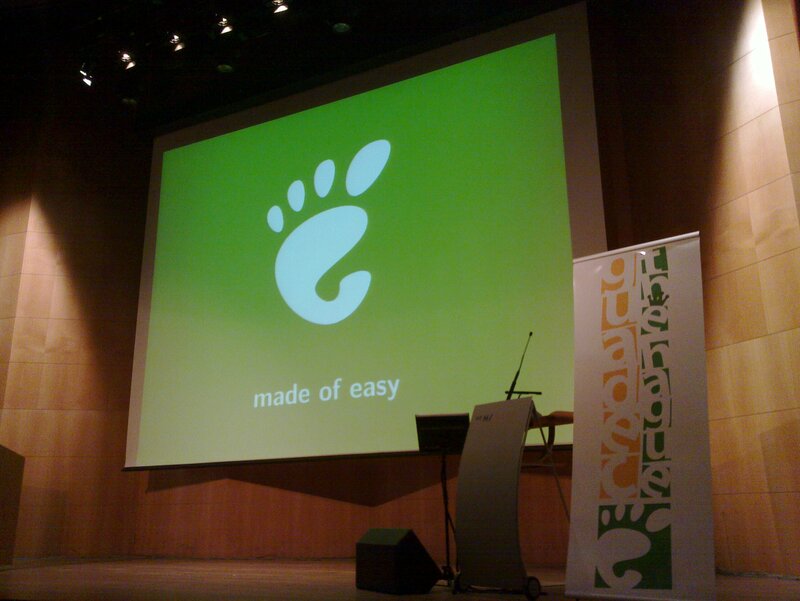 Also we will discuss our strategy and policy of evaluating non trivial contributions to GNOME. Having said all that. I want to that the GNOME Foundation for paying my accommodation and making such a productive week possible.